Looking to rev up your job hunt? Download our free mechanic resume example, then customize it using our writing tips below. 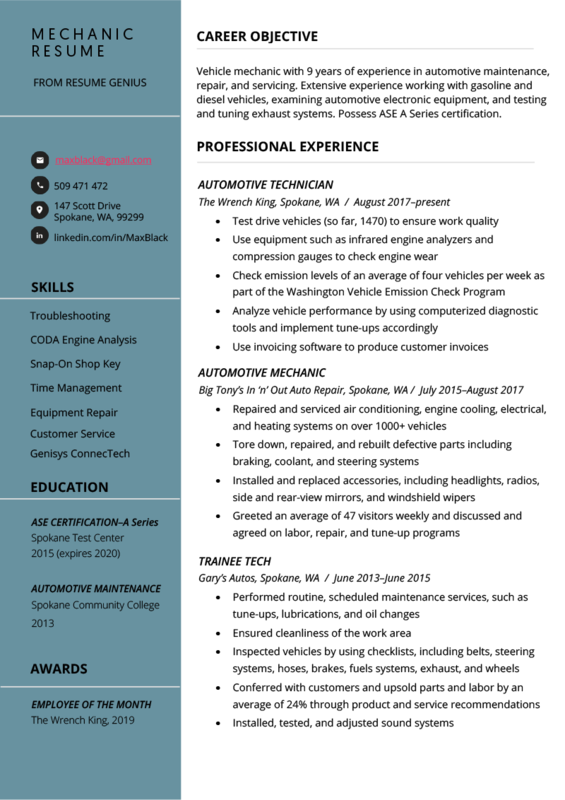 Don't like this resume style? Browse our library of free, downloadable resume templates. Vehicle mechanic with 9 years of experience in automotive maintenance, repair, and servicing. Extensive experience working with gasoline and diesel vehicles, examining automotive electronic equipment, and testing and tuning exhaust systems. Possess ASE A Series certification. According to the U.S. Bureau of Labor Statistics, the average auto mechanic makes $19.02 an hour, slightly above the national median hourly wage. Automotive mechanics in the most northwesterly states, specifically Alaska and Washington, earn the most. These tips will give you guidance for tuning-up your resume. Whether or not you use our mechanic template, you can apply these tips to win over hiring managers and secure yourself interviews aplenty! The professional experience section is typically the largest section on your resume, so it’s vital that you have a great one if you want your resume to be noticed. Similar to other “hands-on” positions, automotive technicians learn most of what they know on the job. Because of this, it’s a great idea to clearly outline your career progression in your professional experience section. By contrast, check out these examples for his current job. The responsibilities described in our vehicle mechanic’s current role are much more complex than those performed at his first job. Doing this showcases his professional progression and highlights his ability to learn and grow to hiring managers. Make sure you illustrate the complexity of your current role in your professional experience section, because it will only strengthen your resume. To really optimize your resume, you need to include evidence of your achievements. Inserting statistics to back up your professional experience bullet points is a great way to impress garage owners and get yourself shortlisted. Here, we can see that our car mechanic successfully upsold parts and services by 24% whenever he spoke with his customers. This valuable piece of information will impress hiring managers, because it reveals how much our candidate can hypothetically improve their profit margins. This statistic is a game changer because it immediately shows a hiring manager that the candidate is no novice. Specifically, that they’ve worked on over 1000 vehicles in a span of just 2 years—a solid chunk of experience. It also highlights that our candidate manages his time effectively, can handle a heavy workload, and has worked on a variety of car models. Because they’ve used different equipment or only worked on certain car models, no two automotive technicians have exactly the same skill set. So, to differentiate yourself from the competition, you’ve got to signal clearly to the hiring manager which skills you have. Your skills section is the primary place to do this. Here, you can list the key tools, equipment, and software that you know how to use. In our example, our hypothetical candidate listed Snap-on Shop Key and Genisys ConnecTech among his skills. Because a garage owner might be seeking someone with these skills, it’s definitely worth listing them. The skills discussed above are hard skills, but soft skills are equally vital to employers. Hard skills relate to things you’ve learned, whereas soft skills concern your interpersonal abilities and personality. Not sure what the difference is? Check out our guide to hard vs. soft skills. Soft skills are crucial for car mechanics because you’ll be working as part of a team and dealing with customers. That’s why our mechanic has listed “customer service” among his several soft skills. In summary, stick in a few soft skills to show that you are a rounded candidate. Just be sure to also get those hard skills in, including the equipment, processes, and software you’re familiar with, onto your resume. Despite much of your education being “on the job,” you’ll still want to mention your educational background and include relevant certifications. This is particularly crucial for automotive technicians who are just starting out, but experienced mechanics should also include these aspects to give garage owners an idea of their background. As we can see, he has his A series Automotive Service Excellence (ASE) certification. Because there are several series of ASE certification, you should specify which one you have. This allows potential bosses to easily see what your specialty is, and make sure that you fit the job description. By applying these writing tips, you can supercharge your resume, improving your chances of impressing garage owners and landing yourself more interviews! If you’re not fond of the resume template used by our mechanic candidate, check out our full library of templates and pick the one that’s right for you. And to whip off a resume in a few short minutes, try out our free resume builder. Finally, if you have any comments, questions, or just want to tell us how awesome we are, please leave a comment below!